Mom update: No real improvement. This entry was posted on 11 November, 2008 at 10:37 am and is filed under Let's Get Visual. You can follow any responses to this entry through the RSS 2.0 feed. You can leave a response, or trackback from your own site. In America, we enjoy the freedom of giving half our income to the government through various forms of taxes. We have the freedom to participate in a Ponzi scheme known as Social Security. We have the freedom to vote for the president. Unlike the voters of Iraq under Saddam Hussein, who only had one choice for president, we have two choices! We have the freedom to choose between Republican-led big government programs and Democrat-led big government programs. We have the freedom to use government-controlled money, which loses value every year. We have the freedom to subsidize the poltically-connected agricultural, automotive, and banking industries. We have the freedom of sending children through the compusory government-run education system, and then pay for job training for those that get through 12 years of schooling and still don’t know how to do anything. We have the freedom to own guns, provided that said gun is approved by the government and we pass the government-mandated background check. If we get the appropriate permits and stand in then proper free-speech zone, we have the freedom to protest. Thanks to all the veterans that defended these freedoms and kept them from being taken away! Disinter, in this country you can freely voice your opposition to our government’s positions anytime you disagree with them. In many other countries you would be imprisoned or executed for such a thing. People in all parts of the world are clamoring to come to America. Is that because we’re a horrible nation? Of course not. Does America have its faults? Of course it does. But our freedoms and the greatness of our nation far outway those faults. (1) In the quiet of your thoughts, without anybody else knowing, ask yourself, in all seriousness, “Why am I proud to be an American?” and then list the reasons. Really think this one through. (2) Ask yourself, “What does freedom mean to me?” And then logically and carefully think this one through as well. (3) Say a silent “thank you” to the men and women who have given their time and treasure and lives over the past 200+ years so that you can enjoy those freedoms. I challenge you to take the time to go through this exercise. I promise it will be OK.
1) I am not proud to be an American. When morons like you stop beating their chests when we murder 1 million foreigners, as we did in Iraq, then I might gain some semblance of respect back. 2) I have. You should definitely do the same. Stop flirting you, two gay marriage was recently outlawed in this state. I stuck to my Trash Tuesday tradition on Veterans Day but I did sneak a photo below my “curbside treasures” of my P.O.W. bracelets. 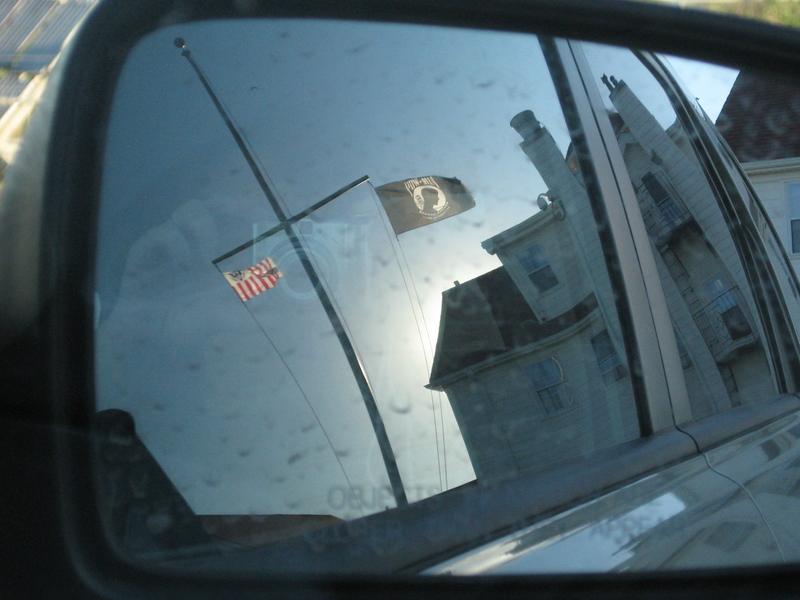 I like this photo, somber (notice how I avoided the word reflective? ).